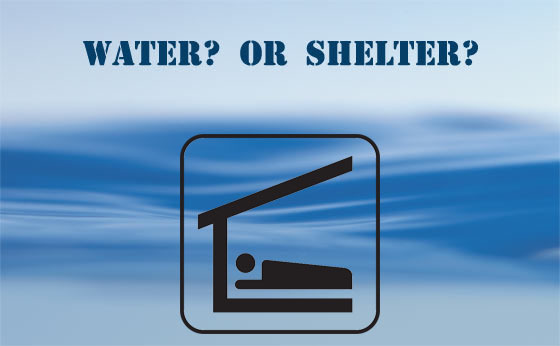 Survival Priority #1 - Water or Shelter? When hiking, I always had a ‘Thermal Blanket’ in my pack. (It’s called by different names.) It weighs very little, and takes up little space. When needed, you wrap it around yourself to keep in body heat. (Also water proof.) I never had to use it, but if and when needed, it could (would) be a lifesaver. Always a must carry, along with fire starters and water & filter. Shelter. If water is scarce or non existent at least you can pass over in some sort of comfort and maybe away from the critters. This is of course a drastic scenario. This subject points out something I’ve long preached about survival. We live in a highly regimented society, especially in many work places/places of employment. Folks are taught to do repetitive actions. They follow rules laid down by their employers. They are taught that if you do “x” and “y” you will get “z” as a result. They spend their lives doing “x” and “y” and getting “z” and everything is fine until one day “z” isn’t available, then they are completely bum-fuzzled. Their mind goes numb, then they panic. How are they ever going to to get “z”? I was Army, not a Marine, but the Corps has a famous motto, “adapt and overcome”. This is a trait taught through all branches of the military, but not so much in today’s society. Many folks are raised by parents that drill that into them while growing up, but many, if not most, are not. Those that are not end up being followers, gravitating to follow anyone who seems to have the answer. Those who were raised to look for better ways to do something, or get the job done when the rules don’t present an answer that solves the current problem, they are the ones who will survive when things get real serious. Many, if not most, folks who die when placed in life or death situations, are the ones who freeze up and do nothing. Those waiting on someone else to lead them out, tell them what to do, or solve the problem for them. Recalling my LEO career, we had what was called the “Force Continuum”. This was a term given to levels of threat and the appropriate and legal response to each degree of threat. This list covered everything from a verbal command to deploying deadly force. It was always stressed that there was no requirement to go up the list progressively before doing what was necessary to survive, rather, you could skip directly to the last resort level immediately if necessary. Knowing lists like “the rule of threes” is good, but experience and desire to overcome obstacles, using that brain God gave you, will be what determines your survival. Several days ago on the article on shoveling snow I mentioned how one should also drink water as you work because you lose a lot of water by breathing it out in cold weather. Point being: in cold weather, there is a lot of emphasis on packing shelter and clothing items. It is easy to forget to pack adequate water/containers for water and a powerful stove to melt snow for additional water. #1 Panic – leads to poor decision making and squandering of precious resources. Your brain is not working. #2 – Bad decisions made within a party. Anytime you have 2 or more people, there is a potential for disagreement. When on extended wilderness trips in a variety of locations, I have been known to split from the group in order to take the more conservative route/less adventurous route/expend less energy and resources route home. Any trip itinerary I make will take into account of: Things-that-will-go-wrong. and I plan accordingly. The group will only travel as far and as fast as the weakest, slowest member. Driving an ambulance for over 5 years did not make me an optimist. When SHTF in a remote location far from home, SHELTER in place with adequate resources to include drinkable WATER supply. My job as a medic was to make sure we all made it home. You simply can not say XYZ is first. Mission Dictates and is dependent on the factors such as climate, work output, threat level etc. Survival priority #1 depends on your present circumstance, and could easily change from one moment to the next. You need to be prepared and able to adapt and overcome. With that said, I hoped to emphasize that ‘shelter’ encompasses more than just a tent or tarp. Weather dependent, it’s pretty crucial. Most assaults are generated within 21 feet of the victim. The amount of time for the perp to reach you from 21 feet is 3 about seconds. It can be even less depending on the circumstances, and may easily be 1.5 seconds. In that amount of time a person has to recognize the threat, make a decision on what the response will be, and to respond accordingly. Personal security is a matter of survival. Survival requires a dynamic approach. Even before reading the article, my mind was made up,, doing chores in negative wind chills. Yep, three days without water. Or hours, maybe minutes before hypothermia…..not even thinking about heat tonight. In which, with heat, I would go with water as a top priority. In a “classic” survival situation, I would say that shelter would be your first priority. The usual situation described is you are hiking/hunting etc and get a little turned around, by the time you finally realize you are lost it is almost sunset…stop, take inventory of your assets and make a hasty shelter, maybe a fire, and hunker down until first light. In the morning, if you can get your bearings and effect self rescue, do so. If you were smart, and left your plans with someone, maybe you forage around, find a nearby water source and start processing water in the morning…gather a bunch of firewood, and when you think you have enough wood, double it. Keep your fire going and make improvements to your hasty shelter and get ready for another night. If you have left your plans and you are now 24 hours overdue, search and rescue should be out looking, so STAY PUT! During the day, your fire can be smelled a long way off in the woods, at night, obviously the light will help draw attention, as well as keep possible animals that may be a threat away. Of course, in a TEOTWAKI situation, all of this may go out the window due to tactical and security concerns, and that will vary by your situation, so be ready to improvise. So true, I believe the priority is situation dependent. In Oklahoma in July, a priority might be water before shelter as there is little chance of hypothermia in 95 degree weather. On the other hand, in Minnesota in January, I would say shelter takes priority. These are assuming it is not a SHTF scenario where someone is chasing you and/or you are injured. Then Security or First-aid would take precedent depending on the situation. Recognizing which takes precedent and how to achieve that goal requires a level head. So, even if you know which takes priority, you must have the ability to achieve that goal such as build or find shelter, obtain clean drinking water, implement first aid for an injury. OK, let’s suppose shelter is a priority and you find suitable habitation. What next? Move down the list to the next priority. Again, this is assuming a person has a level head and abilities to solve those problems. If a person is not level headed, they just might be chasing that big lake of water in the desert just over the next sand dune. focus on building a shelter helps in gaining control over emotions. Builds confidence & gives you a new “starting point” on which to build. A Fire will help keep you warm, provide light, and again help in taking control of your situation & emotions. Water is easy once your FOCUSED. If your dehydrated, water would be #1, if its raining shelter would be #1, if its snowng fire would be #1, if you are being attacked by wild animals/zombies a weapon/defense would be #1, if you are bleeding first aid would be #1. Excellent statements by the posters who are clearly leaders due to their mental preparation for trips into the wilderness (in particular). Of course emergencies like the above can happen at anytime, any place: you could be at home and suddenly be in the center of a massive earthquake or hurricane, etc. The same survival abilities apply – that is, to think and choose quickly. Thank you all. And always remember the best cook gets EATEN LAST !